Sorry, this sculpture is no longer available. Music, drama, dance, and the visual arts are all captured in this dancing minstrel. It is available in monumental size as well. 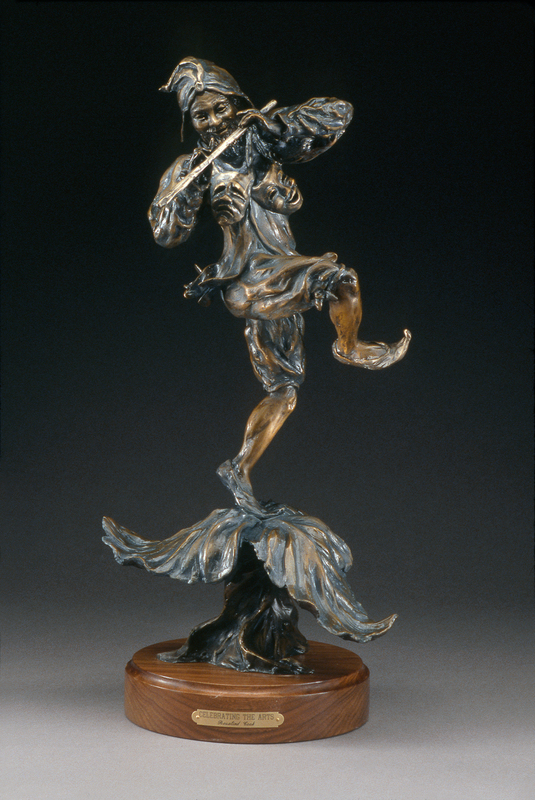 The sculpture depicts a minstrel playing a flute and dancing upon a flower. This image incorporates all aspects of the arts: music, dance, theater, visual arts and humanities. The flower is symbolic of not only how the arts flourish but also of how one "blossoms" through the arts. It is full of joy and movement from every angle and is created to be seen in the round. The minstrel, symbolically and historically, has played a major role in the development of arts and humanities. The minstrels were the traveling poet musicians who flourished during the Middle Ages throughout Europe. They would travel around the country entertaining with the dance, songs, musical instruments and stories. They repeated ballads and folk tales of the time, thus helping to preserve them. They were the most accomplished artisans of their time. The sculpture is also available as a 10 foot monument, appropriate for installation anywhere the arts are celebrated, such as performing arts centers, music halls, theaters or galleries. We’re sorry. This work is no longer available.